Beautiful and rare map of the area of southern Germany showing the area from the French border to Bavaria and north from Bodensee (Lake Constance) to Eberbach on border to Hesse with north oriented to the left. Playing card. Miniature map of Swabia / Schwaben as a playing card. From the engraved playing cards set “Europaeisch-Geographische Spiel-Charte”, published by Johann Hoffmann, Nürnberg 1678. Map only: 11 x 6,3 cm. Extremely rare playing card map. Cf. S. Mann and D. Kingsley, M.C.S. No. 87, p. 22; No. 5 (for those cards of the set depicting the British Isles). No cartographer or engraver mentioned but the world map of the set bears the imprints “J.H. Seyfrid delineavit” and “Wilhelm Pfann sculpsit”. – Strong impression. Backed with early marbled paper to use it as a real playing card or for insertion in boxed set. Outstandingly well preserved. This is a really beautiful volume published in 1895 by the Geographische Verlagshandlung Dietrich Reimer of Berlin. The recently restored binding consists of green cloth with paper label on cover. The original front cover – which was badly damaged – has been kept, and has been pasted down on the inside endpaper. The book itself is large at 520 x 330 mm (height x width); the eight maps are all double-page opening to 410 x 545 mm. Usual age browning for this type of paper: very slight wear to extreme edges of some pages; some very minor tears at edges of some pages (e.g. 13 mm bottom of map 5 but still 15 mm from border). First image shows original cover pasted down with inset of new cover. 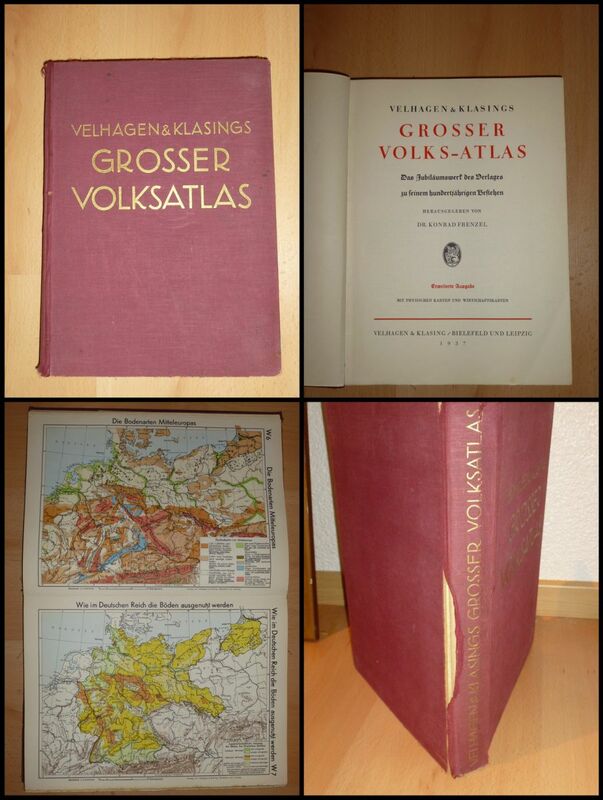 The volume contains 8 large maps all with engraver's/publisher's information: all are Ausgabe 1894. Contents page, index (pages 1-24), 8 double-page plates, statistical text (pages 1-16). Complete. Panorama vom Bodensee. Lithographisches Panorama von J J Kauffmann, um 1860. 12,2 x 125 cm. Mit topographischen Erklärungen über und unter der Darstellung. In 12 Segmenten auf Leinwand aufgezogen und als Leporello gefaltet. Ein Segment mit kleinem braunem Fleck. Im Papp-Schuber der Zeit mit aufgeklebtem Titel. Berieben, Kante teilweise gerissen. Panorama of Lake Constance. 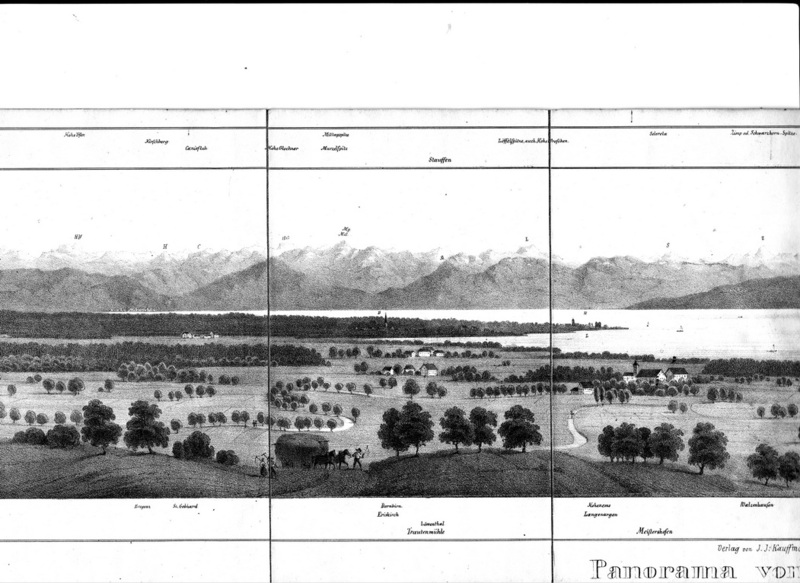 Lovely uncoloured lithographic panorama of Lake Constance by J J Kauffmann, circa 1860. 122 x 1250 mm. View has topographic explanations of places top and bottom. Folds into 12 segments and opens out as a leporello. With contemporary slip case complete with paper label – case split down one seam. Covers slightly rubbed in places, view largely clean with some colouring towards the top. One section has very small brown speck. Stretches from Tettnang in the east (from left) to Romanshorn in west (seen right) with all peaks lettered and identified.Interesting buildings shown such as Friedrichshafen, Trautenmühle and Schloß Friedrichshafen. Typical farming scenes in foreground. Karte von Württemberg, Baden und Hohenzollern mit sämtlichen Eisenbahnen. Map of south-western Germany published by Albert Müller (früher Belser) – Buch & Landkartenhandlung, Stuttgart. 1885. Map is at the scale of 1,450,000 (der natürl. Grösse). Fourteenth Edition. Folding map folding into green boards with title and publisher’s details on cover; reverse has list of other maps published by same firm. Booklet is 180 x 110 mm and has attractive frame to text front and back. Plain front endpaper. Map laid on dark (green?) linen. Karte von Württemberg, Baden und Hohenzollern nach den neuesten Materialien bearbeitet von L Rachel. Publisher’s imprint at bottom Verlag von Albert Müller (früher Belser) Buch & LandkartenHandlung. Signature of lithographers: ART. ANST. V. E. HOCHDANZ, STUTTGART. Inset map showing telegraph distribution. Map covers area from Mannheim (top left) to Basel (bottom left) and to Wurzburg (top right) and Kempten (bottom right). Very attractive and in surprisingly good condition. Only one split in linen: under explanation table in top right. Cover still good although a little grubby. This is a really interesting atlas published just before the beginning of the second world war. The binding consists of red cloth with gilt titles on front and spine; the corners, the spine and the bottom edging (i.e. where book stands) are scuffed and there is a tear to the spine cloth which could be repaired easily. The book itself is 325 x 240 mm (height x width); maps are typically 275 x 200 mm (where vertical) but many maps are double-page and fold out to 275 x 420 mm. The imprint is strong and paper only slightly coloured. One page loose, one map badly repaired with tape (55 Osteuropa). This is a jubilee edition published on occasion of the 100th year of the founding of the publishing house; Das Jubiläumswerk des Verlages zu seinem hundertjährigen Bestehen – herausgegeben von Dr Konrad Frenzel – Erweiterte Ausgabe. The volume contains 92 sides of maps – many of which fold out (so a double-page map has two page numbers). At least one map folds out both vertically and horizontally (50-53; Poland, Baltic and eastern central Europe) and the map of southern Europe across a band from Alsace to Hungary folds out in 5 sections (36-40). Contents page, General Index, Section I on people, world and economy 40 pages with many black and white illustrations and maps within the text, 16 pages of maps covering economic factors, 92 map pages as described above, alphabetical listing of places (116 pages). A paper band inside cover has note on a physical map of central Europe – but no such map is included. I assume this was an extra "removable" map which is missing. However, the extra slip on name changes to Silesia is present (Änderungen von Ortsnamen in der Provinz Oberschlesien). Second Edition – 2. Auflage Verkehrsverband Württemberg-Hohenzollern, Stuttgart im Hauptbahnhof. February 1928. Small guide book to Württemberg, 55 maps and plans; 416 pages. Book in good condition with extra clear foil protective cover, edges of pages slightly scuffed where the folded maps and plans have not been folded back correctly. 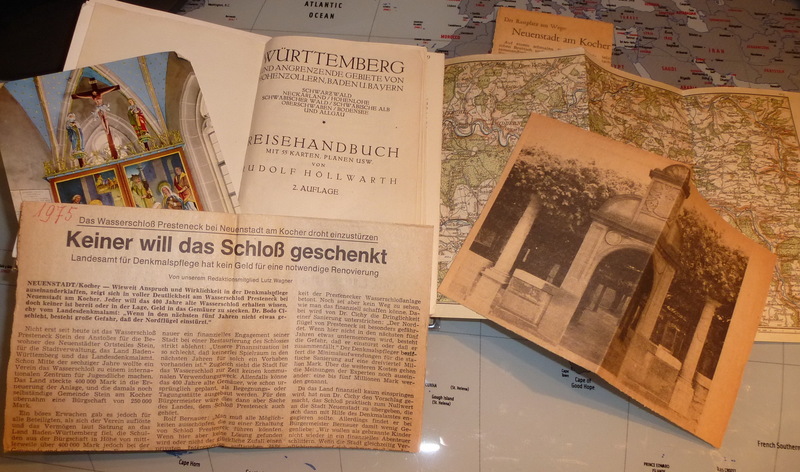 Numerous additions such as postcards, newspaper articles etc. A set of 24 reproduction maps (not exactly facsimiles as they vary in size from the originals) ranging from a copy of a manuscript world atlas map of 1547-76 by Diego Homann to a detail section of a map by J v Sperges of South Tyrol dating to 1762. Each map on the same type and size of paper, 295 mm x 400 mm. Each map is approx. the same size with nice margins. The set, or parts of the set, would be perfect for framing up to approx. 400 mm x 500 mm with suitable passe-partout. Most, but not all, maps are coloured in a very sensitive colouring to suggest the wash colouring of the time. The second map, a woodblock, is in characteristic black and red of the time. Maps are in a presentation wallet which still looks good although a little grubby (it is over 30 years old). Maps are accompanied with an explanatory booklet which, apart from a very minor fold of the page bottom right affecting first two pages only (4 x 10 mm) is in excellent condition. Set would appear to be complete – but no guarantee. PLEASE NOTE - these maps are reproductions. Price €20.00: free postage to Germany. Due to weight and size I must add P&P for other destinations: Postage to Europe €9, other destinations €16! Book or Sheet: Two rare maps prepared by William Pitt and published in the ‘English Atlas’ by Joannes Janssonius van Waesberghe, Moses Pitt & Stephen Swart in Oxford 1680-83..
(1) Detailed map of the area Heidelberg-Regensburg-Luzern-Rosenheim. Uncoloured, Sheet 560 x 670 mm, map 390 x 490 mm. Crisp impression, plate number II top right. No imprint but traces of old imprint within panel (bottom left): Mosem Pitt. Slight browning throughout a little stronger along central fold, good edges and wide margins. (2) Detailed map of the area Heidelberg-Hohenlohe-Freiburg-Memmingen. Published by Moses Pitt and Stephen Swart from the map by Joannes Janssonius Waesberghe ca. 1681. Uncoloured, Sheet 600 x 660 mm, map 370 x 440 mm. Crisp impression, plate number XIV top right. Imprint: Apud Janssonius - Waesbergius / Mosem Pitt et Stephanum Swart (bottom right). Strong central fold and two other creases, ragged edges but wide margins. The English Atlas was not a commercial success and there was only one printing of these particular maps. Quite unusual. €250 for both maps. Free postage. 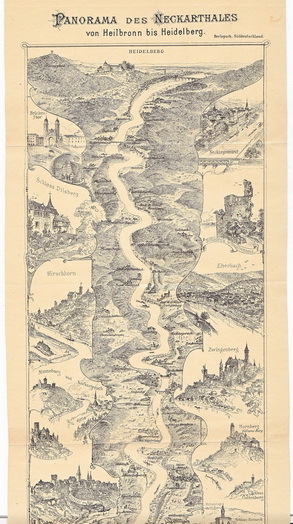 This is a really attractive folding map of the Neckar from Heidelberg (at the top) to Heilbronn (bottom) probably published in the late1880s for Berlepsch in Süddeutschland (what appears to be the publisher’s note top right below title). The folding plan shows the river meandering from south to north, from bottom to top. Roads, bridges and railways are shown as well as attractive views of the various castles along the route. The map itself is 410 x 140 mm (height x width) with title added outside border at top; the views along the sides include Brücken Thor (well-known bridge with gate) at Heidelberg, Eberbach, Hirschhorn, Weibertreu and the Rathaus (town hall) at Heilbronn. Usual age browning for this type of paper although the paper could have had a yellowish tinge originally: almost no wear to edges of page. This was probably a folding map inserted into a guide book. Hermann Alexander von Berlepsch wrote a large number of guides in the 1870s and 1880s. He wrote a guide to south Germany – Süd-Deutschland – as part of Meyers Reisebucher series in 1871 and this map may be linked to that work (from zvab.com) although I believe it appeared later (see below). All panoramas of the Neckar are rare and this one is not listed in the usual sources. Plan has two imprints at the bottom, below the border; Heinrich Burger fec and Lithogr. Von J. J. Hofer, Zürich. Hofer was a successful lithographer in Switzerland (1828-1892). Hofer and Burger traded together from the 1880s to the early 1890s. Germany - Miniature Atlas "PIC"
The tiny atlas was produced by Columbus-Verlag in Berlin-Lichterfelde. Germany still shown as Deutsches Reich with territory in east of Europe but divided by Poland, so presumably the atlas was printed and published circa 1918-1938. This atlas is not dated but a date of 1922 is given on the internet. In greyish card covers with some staining. Maps in comparatively good condition. An unusual little atlas. €20 free postage (or buy six items priced €20 for just €100).